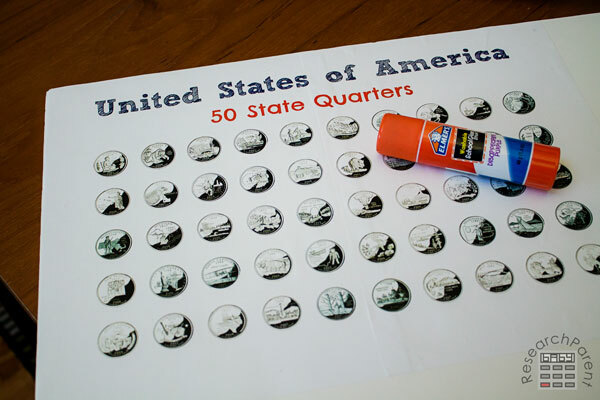 I made this United States quarter collection board so my 7 year old could collect the coins from all 50 states. Since he spent the past year learning United States geography, I thought it would be a fun and educational summer activity for him. However, it’s my 5 year old daughter who has really caught the collecting bug. She LOVES matching the pictures from the quarters she finds onto her board and then taping them into place. 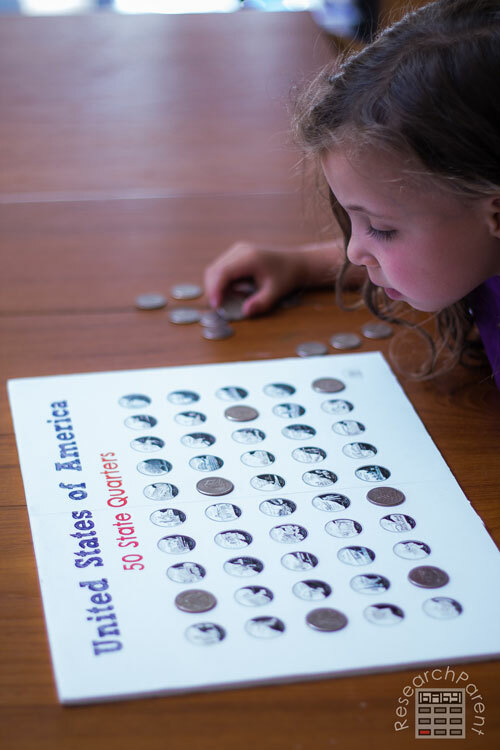 She’s always checking quarters to see if they’re “special ones” and gets so excited when she discovers one she still needs for her collection. Her big brother is struggling to keep up! 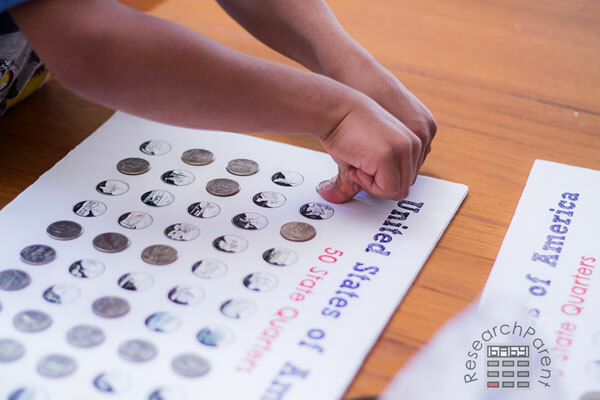 If you wanted to extend this activity further, it turns out the U.S. Mint has free 50 State Quarters Program® lesson plans for K-6. 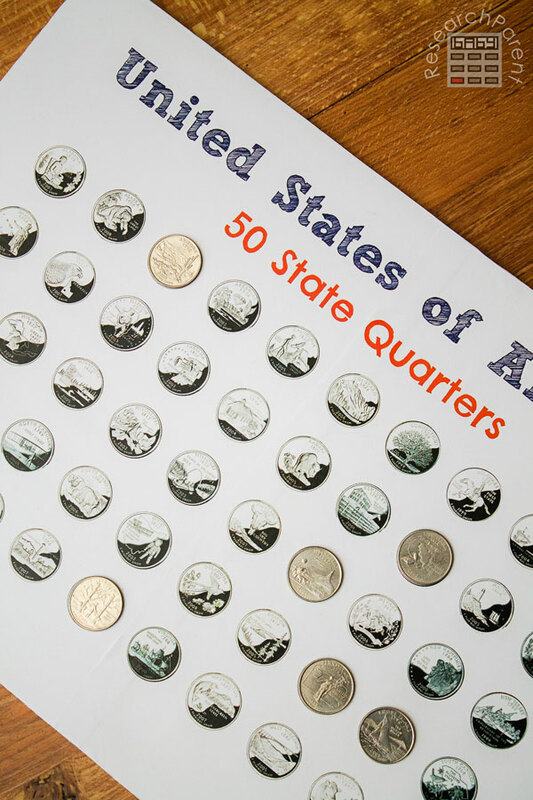 My daughter keeps finding coins from the America the Beautiful Quarters® program, so we may need to start a collection for that soon too. 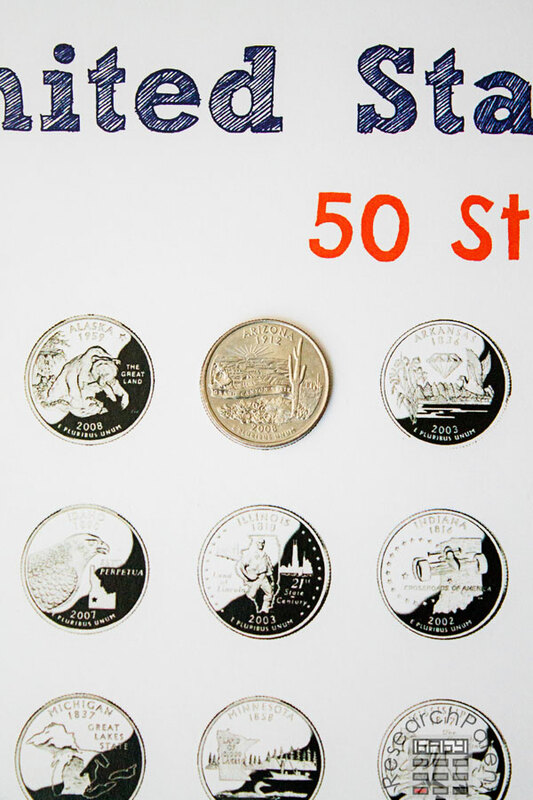 I never realized, but it turns out there are also commemorative penny and nickel collections. Who knew? If, like us, you are also studying U.S. geography, be sure to check out my United States toothpick map for a fun, hands-on activity for learning the locations of all the states! 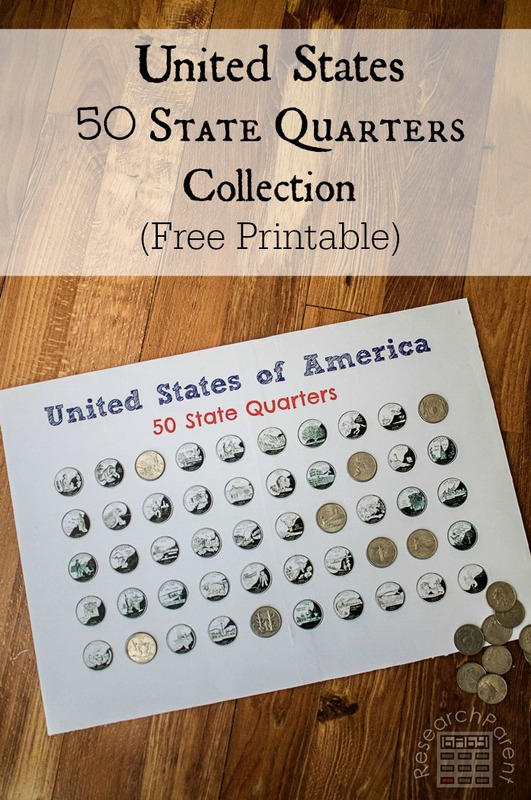 Print out 2 pages of the Unites States quarters collection printable. Note that the first 2 pages are in color and the last 2 pages are black and white, so choose whichever works better for you. Glue the left page onto the upper left hand edges of the foam board. Cut off the extra little strip of paper on the second page as shown. 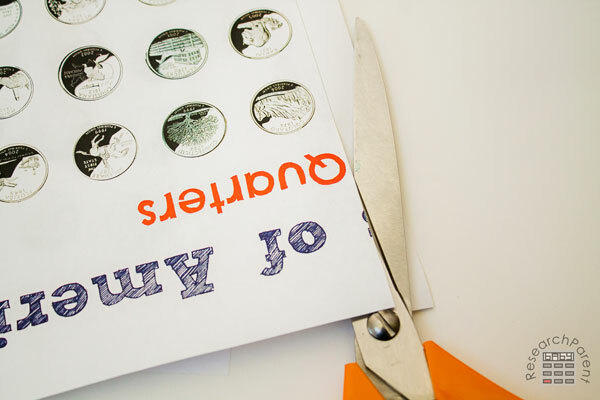 Use an X-acto knife or other sharp cutting tool to cut off the extra foam board around the edges of the paper. 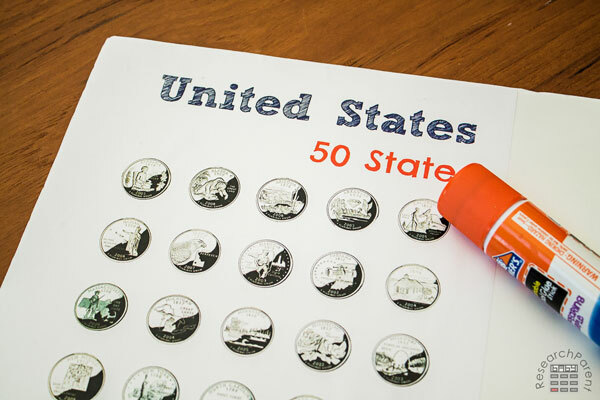 Give your child a few coins to start their collection and let them find the states on the board. Readers can use the alphabetized names. Non-readers can match pictures. 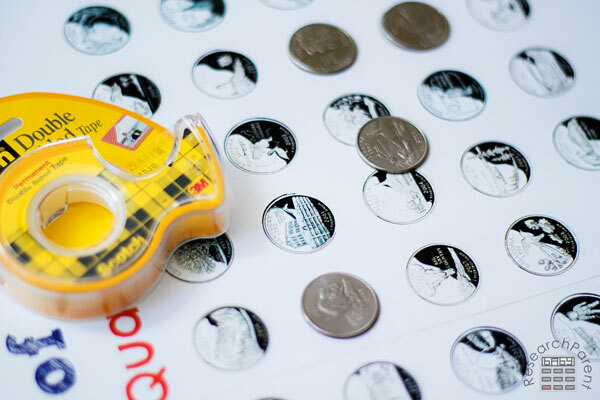 Use tape to attach the quarters to the board. 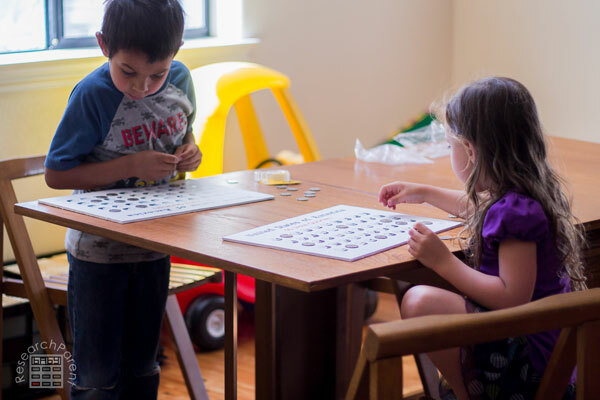 We used double sided tape which had the advantage that if we wanted to switch quarters, we didn’t pull the tape off the board, just the quarter, but rolling up single sided tape works too. Make sure to push on the quarters to get them to stick. Have fun with your new coin collection! 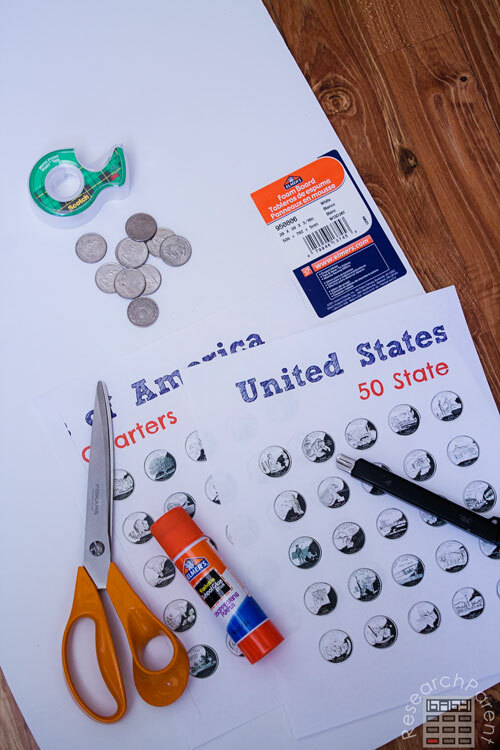 Click here for more Geography activities and printables for kids. Me encanto! 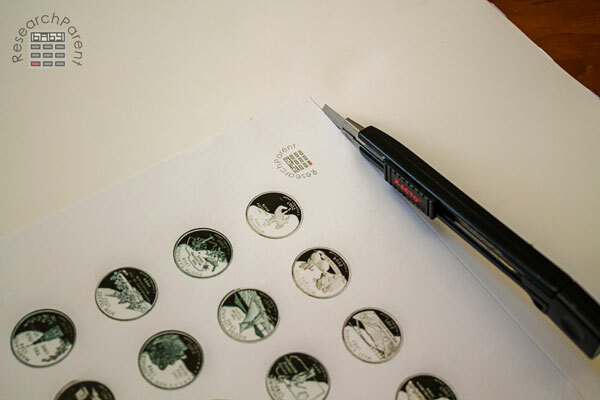 !, soy coleccionista aficionado de monedas, y esta idea es fantástica….